The Regulatory Reform (Fire Safety) Order 2005 requires suitable provision of fire fighting equipment to be made available and routinely serviced and maintained. The correct use of fire extinguishers can help prevent a fire in its early stages propagating into a major fire which statistics prove many businesses fail to recover from. 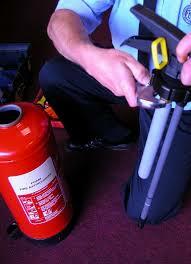 Pyrotec Fire & Security can supply and maintain your fire extinguishers.